Located in Catasauqua, the George Taylor House is the 18th-century summer residence of the Durham Furnace’s talented iron master. Taylor was also a signer of the Declaration of Independence and had three homes in the region. His summer home in Catasauqua is a National Historic Landmark. Biery’s Port Historic District along Mulberry and 2nd streets in Catasauqua is a late 19th -early 20th-century urban neighborhood of mixed residential, commercial and industrial uses. The D&L Trail parallels the Biery’s Port district and offers scenic views of Victorian Era homes. You’ll also see remnants of Lock #36 at E.L. Schmid, Inc., formerly Crane Iron Works. 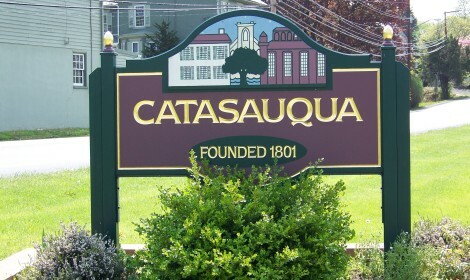 In the early 1800s, entrepreneur Erskine Hazard of the LC&N enticed Welsh ironmaster David Thomas to the area, where Thomas operated local furnaces, laid out the towns of Catasauqua and nearby Hokendaqua, built worker housing, and became prominent in both communities. David Thomas opened the Thomas Iron Co. in 1854, and in addition to building the furnace plant, the company owned the entire town. Hokendaqua’s proximity to both the Lehigh Canal and limestone quarries made it a hub of industrial production. The town became part of the regional cement belt, and a production site for Portland cement.